Why Wait for New Years? I decided to start my New Years resolutions a week early. 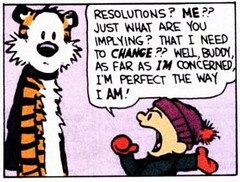 To be fair, my resolutions are things that I have been actively working on improving anyways. Now it’s just “super official” because I wrote it down in Evernote. I like doing things today. The idea that I should pig out and be extra lazy this week because I’m starting my resolutions next week is nonsense. If you really want to change, and I mean REALLY really, then do it today. Do it right this second. Bam! Just like that you are resolved. Anyways, if you think you are committed to your resolutions and you start next week, I wish you luck. Talk to me in March and we’ll compare notes.